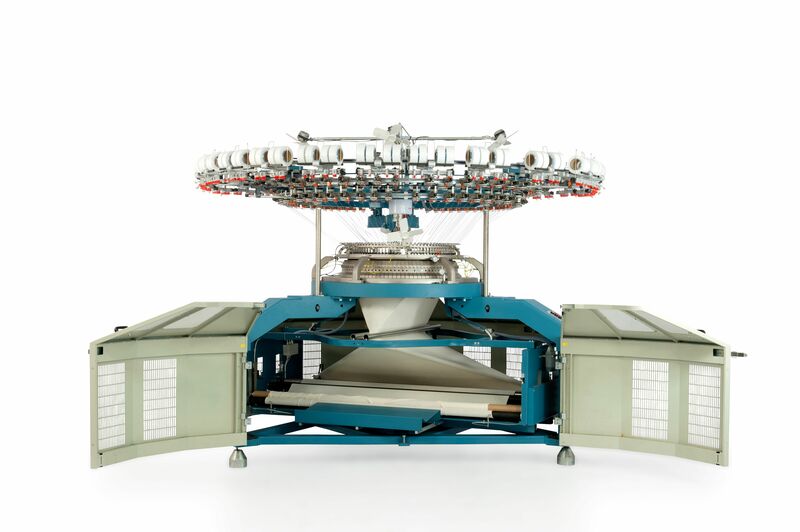 Single jersey machine with 3 feeders per diameter inch capable to knit up to 4 track structures, with/without lycra. Excellent to knit two or three yarn plaited fabrics with uneven yarns like slub yarns,with high production. Double guidance sinker cams in combination with well designed sinkers with tail,ensures uniform loops all over the fabric &less wear &tear of sinkers. Needles with 8 mm latch length ensuring a perfect plating. Yarn carrier in front of the raised needles for a perfect plating at high speed. Individual cam shells made by special aluminum alloy(ergal)having a great heat dissipation property. Automatic positioning of the fabric take down for quick removal of fabric roll. Possibility to convert the machine for the production of three thread fleece. Available with tubular as well as Open width frame(standard and industrial)equipped with motorized slitting and opening system by oblique bars(Vignoni patent). Open version can easily be converted into tubular from by a simple operation. Very compact open frame for an easy access to the knitting head.